Aristide Collins, the former vice president for development and alumni relations, will lead Thomas LeBlanc’s presidential transition team. 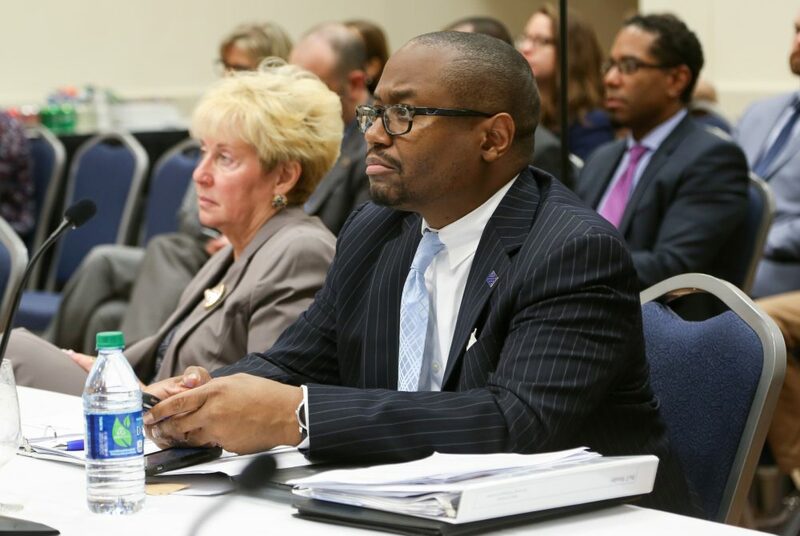 Updated: Feb. 6, 2017 at 11:50 a.m.
Aristide Collins, who served as vice president for development and alumni relations, will lead Thomas LeBlanc’s presidential transition team, leaving the University’s development office just two years after arriving. Experts say that turnover in high-level positions is common when new presidents start their terms, and that LeBlanc will likely bring in his own fundraising team when he starts in August. University spokesman Brett Zongker said in an email that Collins will remain as vice president and secretary of the University after LeBlanc’s transition is complete. Matt Manfra, the associate vice president for development and alumni relations, will serve as interim vice president for development and alumni relations. Manfra joined the University’s alumni engagement team in June 2015, coming from a similar role at Syracuse University. “He will continue the important work of leading the division in pursuing the priorities of the Making History campaign,” Zongker said. Zonkger said decisions about a search for a permanent vice president for development and alumni relations will be made after LeBlanc becomes University president Aug. 1. Jeremy Gosbee, the president of the Alumni Association, said Manfra has been a “strategic leader” of alumni relations, which will help him lead the rest of the fundraising campaign. Leaders have prioritized improving GW’s historically low alumni giving rate in recent years, an area Manfra would have contributed to in his current role. Collins stepped into the role of chief fundraiser in January 2015, but his history of fundraising for GW dates back 17 years, when he aided in fundraising for the Marvin Center. He also helped secure $80 million in gifts that renamed the Milken Institute School of Public Health. Mike Morsberger, the former vice president for development and alumni relations who was replaced by Collins after leaving the University in November 2014, said at the time that Collins was a “good man” who was respected and well-known by members of the University community, including donors and trustees. Collins led the fundraising office through the bulk of the public phase of the campaign and guided the division through ups and downs in hiring. Jay Dee, the director of the higher education doctoral program at the University of Massachusetts, Boston, said top-level administrative turnover with the arrival of a new president is common because he or she will likely want to select members of their team and those who work in the offices directly under them. Dee said the new president should take advantage of the vacancy in development to reconsider GW’s fundraising operations in what he said is a nationwide fundraising environment that is struggling to appeal to young donors. Alumni relations and fundraising leaders have been devoting attention to projects like Flag Day and the Senior Class Gift Campaign over the past few years to help create a younger donor pool. Matthew Lambert, vice president for university advancement at the College of William & Mary, said the change in leadership should not affect the fundraising campaign. The campaign, which publicly launched in 2014, has raised more than $960 million from 63,000-plus donors and is expected to reach its goal this year – one year before the scheduled end date. Lambert said because Collins is only switching roles and not entirely leaving the University, he will still be a valuable resource to the fundraising team as they finish up the campaign. Collins’ experience will serve him well as the presidential transition leader, because he has built networks within and outside of the University through raising money, he said. “The person in that role knows a lot of the key players and constituents and can really help as the new president is coming in to get established with alumni, donors, parents, as well as on campus with deans, faculty and academic leaders,” Lambert said. Having GW’s top fundraiser chair the transition team could also show a dedication to fundraising and philanthropy, especially as University leaders try to address a heavy reliance on tuition revenue, he added. This particular financial battle could be a challenge for LeBlanc, who is coming from the University of Miami – an institution much less reliant on tuition. The $1 billion campaign is likely to finish in the next few months, but Lambert said that having Manfra lead the team to that goal won’t take away from Collins getting the recognition he deserves. The Hatchet incorrectly reported Matthew Lambert’s title. It is now correct. We regret this error.